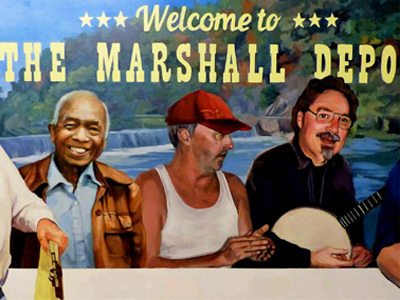 Welcome to the Appalachian Mural Trail! Brighten your day, click on 'mural maps' and look at magnificent murals created by passionate mural artists and community groups. Find your favorite murals, then create your own itinerary with directions to travel and see the murals first hand. 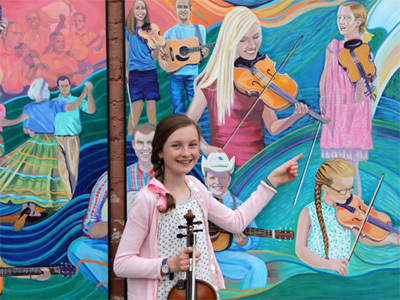 Once you're lucky enough to be in front of a real mural, snap a 'selfie' in front of the mural and upload it to our selfie page. You'll really be lucky, for you'll receive a free tee shirt in the mail that says, "I hiked the Appalachian Mural Trail!" We are inspired by the honey bee hive where all community members work together for the well being of the whole. 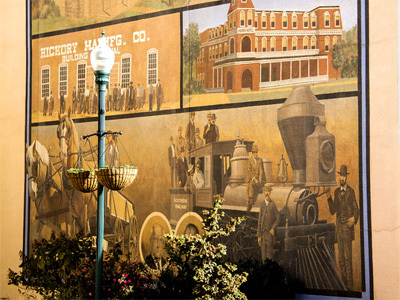 Many of our members worked as a community to create murals that tell the story of their town. 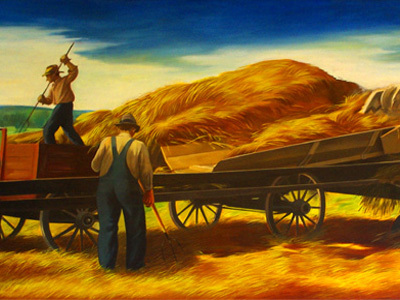 Some of the murals hold the brush strokes of dedicated townsfolk, both young and old. Mural artists rendered the sketches and communities helped paint the works of art. What has been realized is that the communities involved had a rise in local pride, the town upgraded itself more throughout and the economic impact was felt by everyone. 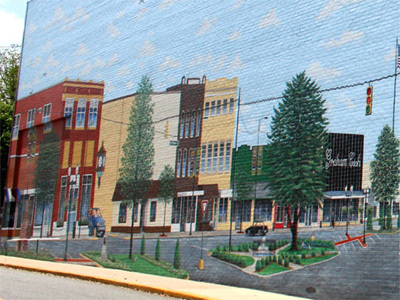 Other murals had individual artists that were commissioned by a concerned town or townsfolk to beautify and show respect for their community. 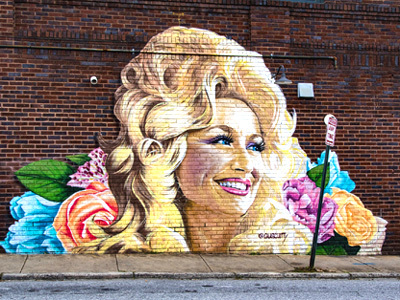 Some of these amazing murals are blocks long or hidden in bathrooms. 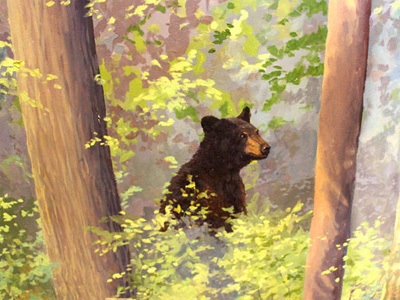 Enjoy your journey into the Appalachian Mural Trail! 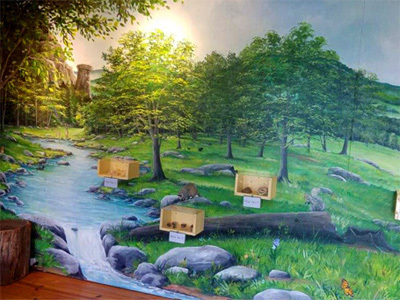 "We have travelers say they went on the mural trail and enjoyed it very much. You folks are doing a wonderful job." 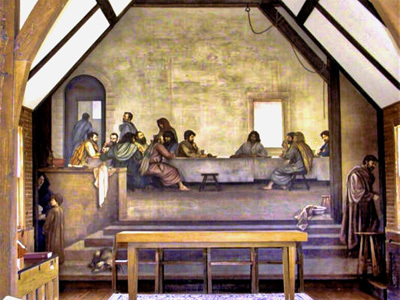 Early in 2018, docents spent considerable time in researching, preparing information and images on the churches, descriptions of the frescoes, and biographies of all the artists to submit to the Appalachian Mural Trail to begin our parish's membership in that organization. We think this was a valuable asset to our spreading the word about our frescoes and our message. This fall we learned that for the first time ever several thousand more persons visited Holy Trinity Church than St. Mary's in 2018. 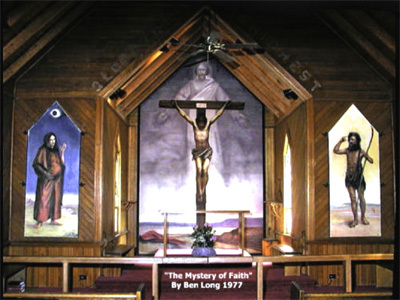 We believe a possible reason for this increase in visitors to the smaller church could be that persons traveling the Blue Ridge Parkway and aware of the Mural Trail are more likely to stop at the nearest church to the Parkway. 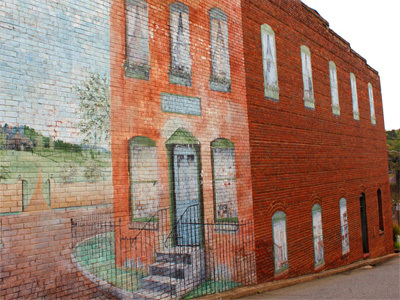 Interested in starting your own community historical mural? 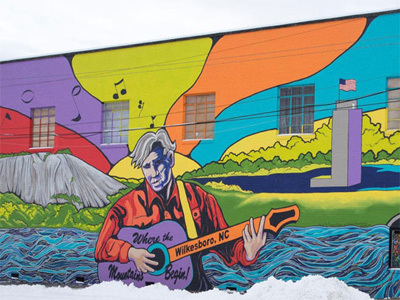 Then by clicking "Mural Partnership", we can help you with 'how to-' select a mural site, call for artists, research your community history, select a mural artist, paint a mural (including materials, transferring images) and dedicating a mural to the Appalachian Mural Trail. 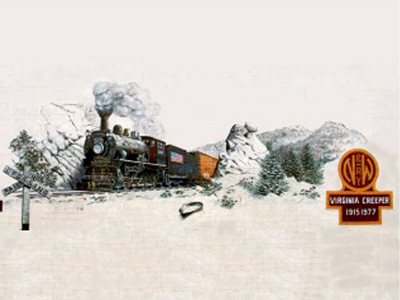 If you already have an historical mural in place, then click on "Member/Sponsor" to have us promote your mural for a small annual fee throughout the Blue Ridge and beyond. Over the past 20 years small rural towns have seen their Main streets dwindle into shadows of what they were in the past. Businesses close down and areas of disrepair seem unstoppable. Yet some small mountain towns have found solutions by strengthening their community through working together to create something to be proud of. 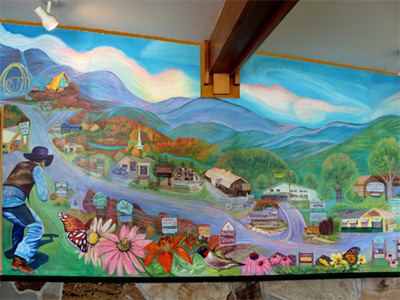 One of the murals now featured on the Appalachian Mural Trail was the brainstorm of Holly Thomas who wished to create a large mural to feature the history of Marion and Smyth County Virginia. Holly planned it to be a community project to restore pride and hope in an area hit hard by recession. 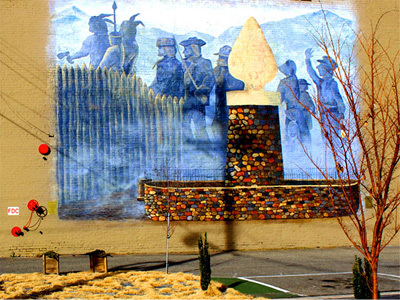 After much research she created the first rendering of the mural in the fall of 2009. She finished the final drawing in the spring of 2010. 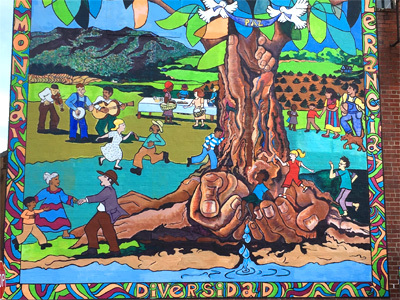 "We wanted more than one artist to paint this mural to create community pride and ownership of the project. 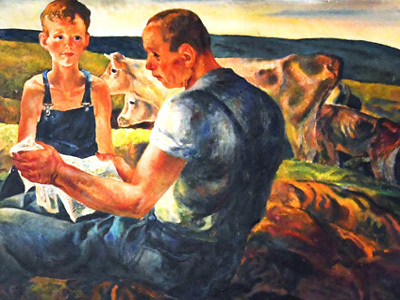 It was never about me as an artist, or what my vision was, but about creating a touchstone for learning and self-esteem for Smyth County and Marion," says Holly. 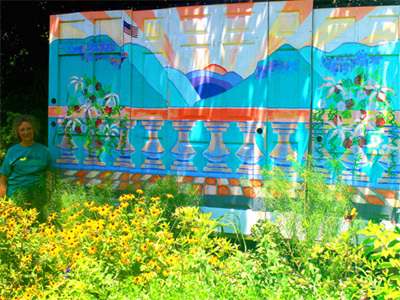 The community mural is accompanied by a fence and benches, so people can sit and look at the mural. The fence project was a Boy Scout eagle badge project for Ferris Ellis. 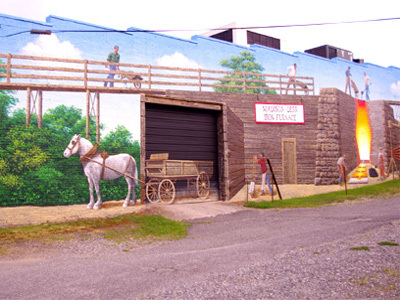 The front of the fence is painted as a tribute to Smyth County children and the county's heritage, and the back is painted as a tribute to Smyth County farmers. All who worked on the mural project enjoyed the challenge and working together with others in the community. Those who were retired or unemployed found purpose during those days and hope that things would improve. 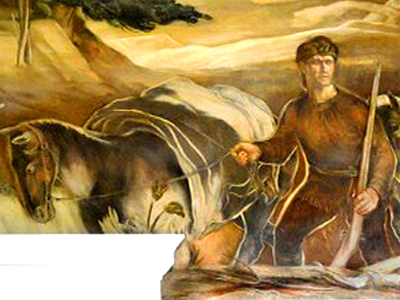 This mural was created to show the diversity of the pioneers who settled the Appalachian Mountains in Western North Carolina. 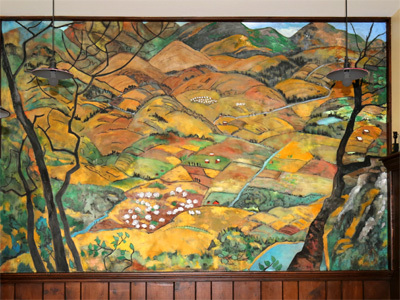 Inclusive with the African American, Cherokee and the Scotch Irish settlers, this art shows the spirit of the mountains! 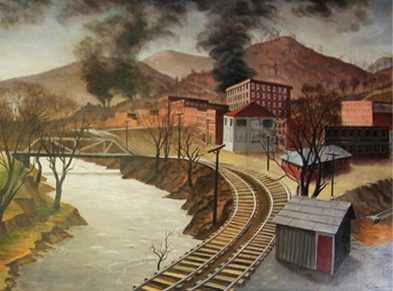 Go to www.doreylart.com to see more works of fine art which illustrate the beauty of "little bits of Appalachia!" 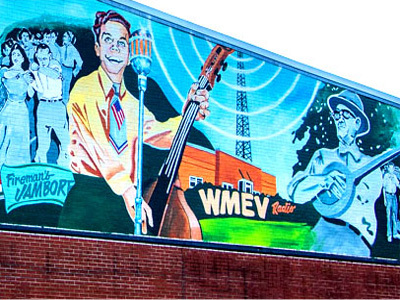 Our vision is to bring world attention to mural art that tells the story of the people. Our mission is to shine a light on public art murals that tell community stories which help increase the pride of the local people by beautifying and showing respect for their community. Becoming a member of the Blue Ridge Parkway Association in October 2016 began the first official step for the Appalachian Mural Trail(AMT). 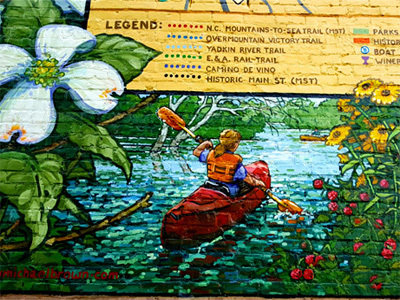 The Appalachian Mural Trail is now drawing high quality visitors into communities where they are learning about the community, it�s history and see the amazing art rendered by the mural artists. Quality of life for all is being enhanced. 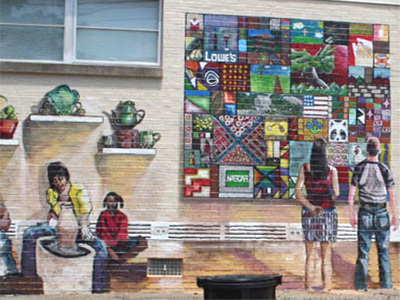 Communities and organizations that have public cultural murals can become a member of the AMT. 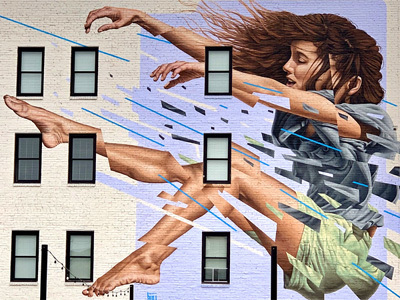 Once accepted as a member, AMT will create a a landing page on the website, muraltrail.com, which showcases the art, tells the stories of the murals, features the the artists' biography and give directions for visitors to find the murals. Promotion of the AMT website comes through search engine optimization, colorful AMT rack cards placed in state Welcome Centers, Chambers of Commerce and other visitor centers in major attractions. As we add new members AMT rack cards are placed in their area. 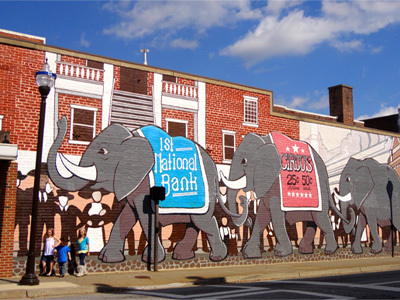 We are members of many tourism hosts that help promote the mural trail. A public interest story is written about each new AMT member and sent out in a press release to local, national, regional and international media. Both visitors and locals are drawn to the AMT website to use the mural map for their traveling journey into art and history! AMT social media includes a facebook page and each member landing page has a comments/blog section. 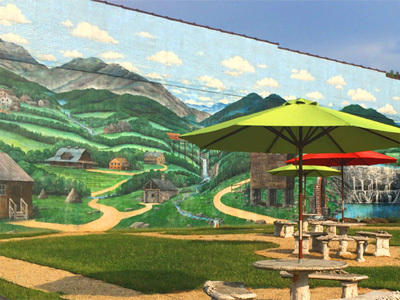 The mural trail encourages participation in the trail through offering a free mural trail tee shirt to visitors who take their 'selfie' in front of a favorite mural. We also have a 'mural spotting' page for folks to make us aware of murals in their neighborhoods for possible inclusion on the mural trail. Each new member receives a mural trail plaque which is placed on or near the mural to signify the mural is an important mural and worthy of inclusion on the mural trail. After 10 years of research, the Appalachian Mural Trail(AMT) came alive in 2016 at the hands of Doreyl Ammons Cain and her husband Jerry Cain. 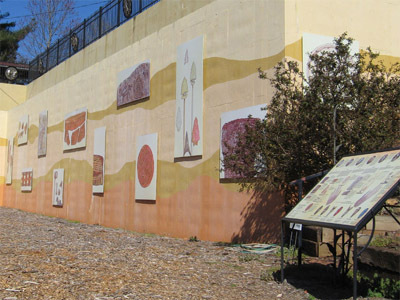 The project has now blossomed into a viable, expanding success with over 80 North Carolina and Virginia historical murals on the trail. 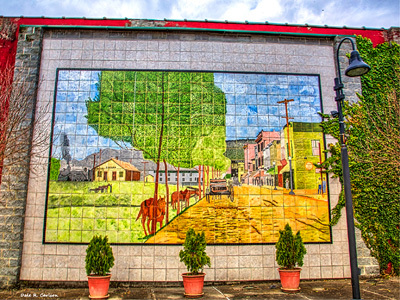 Doreyl is currently the acting Director of the Mural Trail and co-founder of a non-profit organization called Catch the Spirit of Appalachia, while Jerry is the Designer and Website Engineer of AMT. 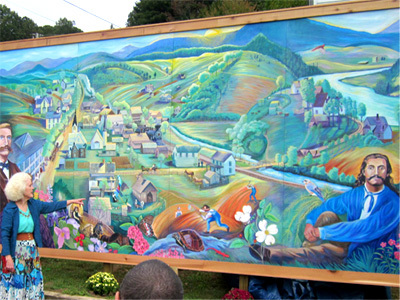 "Jerry & Doreyl enjoying a little mural spotting"
The honoring of our stories through the arts is the core essence of the AMT�s vision and now it is becoming a reality through the hosting of community murals in small communities to large cities throughout the surrounding Blue Ridge. 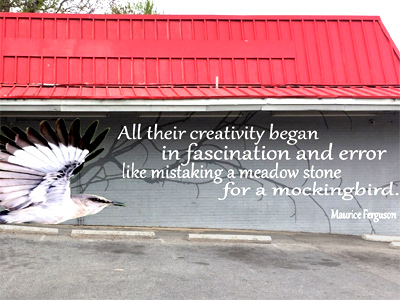 These murals are spotlighting the creativity of our talented local artists. We believe this is enhancing the visitor's experience and uplifting community spirit! The Good of the Hive is an artistic initiative founded by Matthew Willey on a personal commitment to hand-paint 50,000 honeybees in murals around the world.